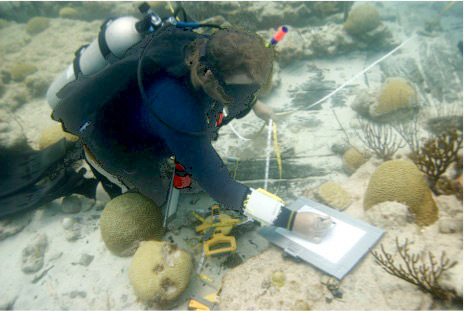 Student at work in the University of Rhode Island Bermuda field school. 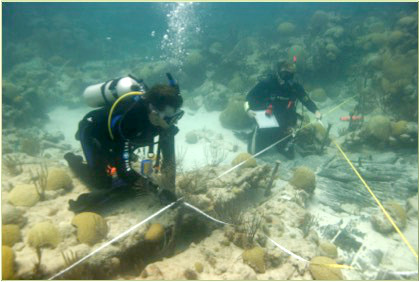 The 2015 Field School in Maritime Archaeology is an ongoing research expedition conducted in Bermuda by faculty of the University of Rhode Island. Participants come from the University of Rhode Island and from other colleges and universities throughout the United States and Canada. The field school is a research-based learning experience that exposes students to a variety of activities including archival research, artifact conservation, archaeological survey, and underwater excavation and documentation of historic shipwrecks. The field school will be conducted in the three-week period from July 20 to August 8, 2015. Students will receive 3-6 undergraduate or graduate credits in history. The field school meets many of the fieldwork requirements for anthropology and archaeology majors at universities in the United States and beyond. Professors Rod Mather and James M. Allan of the University of Rhode Island History Department are the program directors. Dr. Allan and Dr. Mather have extensive experience in underwater archaeological field methods, remote sensing, archival research, and scientific diving. Course enrollment is limited. There are no academic prerequisites, but all participants in the field school must be scuba divers certified to at least the Open Water level, and all must be at least Scientific Divers-in- Training as specified in the American Academy of Underwater Sciences’ (AAUS) Diving Safety Manual. Contact Dr. Mather or Dr. Allan to discuss how the latter training may be obtained prior to the start of the field school. Students must have their own diving equipment (tanks and weights will be provided). Students learning survey techniques in Bermuda. While in Bermuda, students will participate in each of three research modules: laboratory training in the museum’s conservation facility, archaeological survey and documentation of historic shipwrecks, and archival research in the Bermuda National Archives, located in the nearby city of Hamilton. Students selecting the 3- credit option will be required to keep a field journal containing details of each day’s research activities, instruction, and procedures. Journals will be submitted for evaluation at the end of the field school. Students will also be required to prepare and submit a scaled plan of the shipwreck site that we will be documenting, and will participate in preparing a collaborative report on the field school that will be submitted for publication in MariTimes, the magazine of the National Museum of Bermuda. Students selecting a 6-credit option will be required to complete all activities for the 3-credit option plus a research paper using materials presented in the course reader, supplementary readings available in the National Museum of Bermuda’s library, or from primary documents available in the Bermuda National Archives. In addition, while in Bermuda students will attend periodic evening lectures on such topics as ship construction, archaeological theory and methodology, archival research methods, archaeological survey methods (magnetometer and visual survey), site excavation and mapping, analysis of archaeological data, and the conservation of waterlogged artifacts. The course fee is $3,500, all-inclusive, except airfare. Full course credit. For additional information contact Dr. Mather (RodMather@uri.edu) (401-874-4093) or Dr. Allan (jallan@stmarys-ca.edu) (925-253-9070). Application form and additional information are available on the field school website at http://www.uri.edu/international/bermuda. For information on the research diving requirements contact URI’s Diving Safety Officer Anya Hanson <anyahanson@uri.edu. 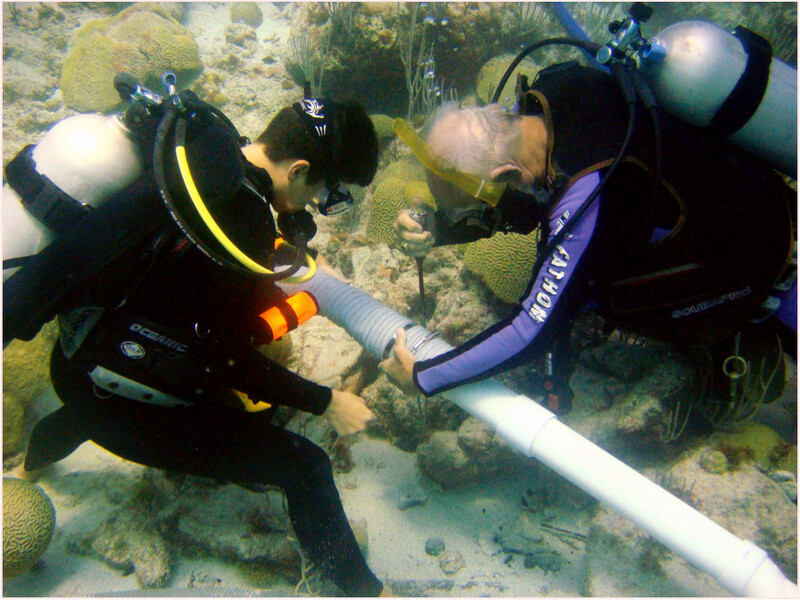 Student working with instructor Dr. James Allan in Bermuda. The Illyrian Coastal Exploration Program would like to invite individuals interested in Mediterranean archaeology to apply for the 2013 underwater sciences field school. Set along the beautiful Dalmatian coast from July 8-21, the course spends one week each in Croatia and Montenegro. The field school is hosted by the International Centre for Underwater Archaeology in Zadar in collaboration with RPM Nautical Foundation and Transylvania University. Students will work with the international team to learn the basics of underwater archaeology and coastal ecology. This course is suitable for beginners, especially undergraduates and masters students. Participants will learn survey methods, underwater recording, and help with ongoing research. There will even be a chance to see advanced methods up close with a visit to the deep sea research vessel *Hercules*. The field school will explore shipwrecks dating from the 4th century BC through modern times and record artifacts from many different time periods. Though the field school is a general survey of maritime archaeology topics, students will leave with a good understanding of the fundamental theories and practical techniques used by archaeologists. A ten day field school is offered through the Albanian Center for Marine Research from July 23-August 2. This field school will explore the fantastic shipwrecks of southern Albania, ranging from the 5th century BC through World War II. Albania offers untouched submerged sites due to the former communist government’s complete restriction on diving, making Albanian diving today similar to 1950s Mediterranean diving at large: pristine and full of underwater heritage. Students and staff will be housed in small local hotel in Saranda, directly across from the island of Corfu and near the Butrint UNESCO World Heritage Site. The Center is also offering an AAUS scientific diving course. If you arelooking to upgrade your recreational/sport diver certification in order to work or help out on university or professional projects, AAUS scientific diving teaches “everything but the hard hat.” After this course you won’t just know how to dive, you will know how to work underwater. This intensive course will be from June 20-July 3 in beautiful southern Albania. ADMAT & ADMAT-FRANCE are running a Maritime Archaeological Project to continue the Survey work on The Tile Wreck 1720’s wreck as well as a new wreck called The Island Wreck in Monte Cristi, in the Dominican Republic. The work is being carried out for the Oficina Nacional de Patrimonio Cultural Subacuatico (ONPCS) the Government department. years of age, with a minimum qualification of PADI Open Water / BSAC Sports Diver or equivalent. The project language is English. Two week slots available. Additional information about this project can be found on ADMAT’s website. This is a hands on course going through the process of artefact documentation working on the artefacts from The Tile Wreck. For further information on this and other projects, please look at ADMAT’s website (http://www.admat.org.uk/). Dr. Simon Q. Spooner, BSc, MRICS, PhD, MIfA. Norman Krischer: periodic guest diver and enthusiast. For more information you can view their project PDF here. The University of Rhode Island and St. Mary’s College of California are offering their joint maritime archaeology field school in Bermuda again this year. The dates are 22 July – 10 August 2011. For more information contact either Dr. Allan or Dr. Mather. You are currently browsing the archives for the Field Schools category.